Conditions were right and you took me to the perfect spot to catch fish last weekend. I appreciate the sharing of your techniques and lures, and look forward to doing this again---with the same success, of course! Richard has been putting me on fish for years throughout the western states. He's really got Clear Lake dialed in and our best days have been there. Thank you for the opportunity to fish with you. I thoroughly enjoyed the experience of catching my biggest fish ever! I wish you every success in your GUIDE business. I've fished with you in Texas, New Mexico and California, but the best experience was on Clear Lake, where you guided me to that spot where all the big ones were. What a terrific time I had catching some of those, including that 10.1 pounder! Thank you for taking the time to show us the best spots on Clear Lake. I am still amazed at the number of fish you were able to guide us to. In the short 4 hours, I believe we caught almost 20 fish!! We just wanted to take the time to jot down a note and thank you for your hospitality and fishing knowledge. You are a very kind gentleman. I wanted to thank you again for the nice time fishing. I had a great time and learned a lot from you. You showed me some spots that helped us tremendously in the 100% bass TOC last weekend. At the end of day 1 we were in 4th place overall with 24lbs. We struggled on day two and were able to pull into that marina at Corinthian Bay and cull two fish that won our division for us and boosted us up into 9th place overall and a check for $1355.00. I never imagined that we would place in the top ten of our first major TOC. Thanks again! "It's hard to know who is a good fishing guide sometimes, but when you randomly meet one that pulls up to you at the dock and has his fishing guests for the day pull out of the boat 5 5lbs. largemouth bass and them all saying that this was just some of the 20+ bass they caught you know he's the real deal. Also, his website can give you a taste of how good Richard is as a guide. The picture with Steve Baldwin & Ed Sparks is one that I saw taken with my own eyes. In fact, I was standing to the right of them and one of them had his hat on my chair. So no question about it, Richard knows his lake and knows his bass. 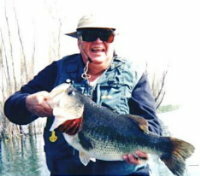 Details of pricing are on his site, but for an unforgettable day of bass fishing at Clear Lake, I'm going to call Richard next time." Thanks for a great day of fishing. Thanks in particular for treating my son, Jason, just like his own grandpa. Couldn't imagine a more pleasant guide/person to take us out. "Like no other guide I've been with, you were enjoyable, knowledgeable and most importantly, able to put me and my son on all those large fish. My favorite, of course, was the 10.8 lb bass. Thanks, Richard, for my biggest fish ever!" Just a note to thank you for three days of great fishing. It was great being on a boat with you; we learned a lot and caught more fish than we ever expected. I doubt I will ever have three days of bass fishing like that again -- but maybe so, since we plan to come back again. My sons and I really appreciate how hard you worked for us. When Katia and I stepped onto your boat we weren't sure what to expect but you showed us the best day of fishing either of us have had yet. More importantly than the great time we had catching one big bass after the next, you taught us the tricks of the trade that we'll carry throughout our lives. Thanks Richard, can't wait to do it again and break the 10 pound mark!! Thanks for a great morning of fishing ! Despite the weather (right after a cold front had passed), you put us on some nice fish. The kids had a wonderful time. We'll have to do it again in the summer. Also thank you for the nice picture ! Just wanted to say a big Thank You for the trip out yesterday! Mike and I had such a great time and really appreciated you teaching us about the lake, how it fishes during the different times of the year, but most importantly putting us on some of the best fishing we have both ever experienced! That was truly a trip of a lifetime. You are the Clear Lake MAN! Thanks again guy! Just wanted to thank you for our outing Sat morning! I learned more in 7hrs with you than I have in the last 7 yrs fishing this lake. I knew I would catch fish...but most of all I enjoyed your attitude and your willingness to share your knowledge with me, looking foward to our next trip and I will recommend you to my friends. Thanks again! Thank you soooo much for the trip on 2/3/05. Your the best!!! Your trip was the most fun Wendy and I had on our entire vacation.Your sense of humor and patience with our newness to fishing was wonderful. I'm so glad we decided to hire a guide and that it was you. We will be back asap and wouldn't go out on the lake with anyone else. Thank you for another GREAT day on Clearlake. I thought that I was at my "peak" in November '03 with my quantity and quality of fish (67 in two day's) and now you have taught me the finesse of the drop shot and sight fishing...Wow, what a thrill! Dan appreciates your expertise and knowledge as a guide on the lake and of course, he only wanted me to learn from the BEST. I am looking forward to my next lesson. I just wanted to let you know how much I appreciated you taking the time on our trip to make sure we had the best fishing experience we could. I was getting a little discouraged with fishing until you took us out and put us on 22 quality fish! You were a gracious and professional host. I would defenitely recommend you to everyone I know and I will defenitely will be a return customer....Thanks again so much for a very memorable trip!!! I just wanted to send you a quick note regarding our fishing trip on 09/10/05. I cant begin to tell you how much I learned during our day with you. It was by far the best fishing trip I have had in my 35 years. Obviously, as my brother had come out earlier in the year, he too was very impressed with your professionalism and knowledge. I will DEFINATELY recommend you to all of our friends and family. And if anyone is considering your services, look no further, youve found the GUIDE youre looking for. We had a great time with you and would love to join you again someday. You were one of our highlights up there in Clearlake. Thanks again for the wonderful time you provided for us. You were a great guide and provided just the kind of fishing adventure for my sons will remember for a long time. Chase (6, oldest) and Austin (5, youngest) absolutely loved it and have been telling their mom, their friends, their teachers, and just about anybody else who would listen, all about the "whale and lots and lots and lots of fish" they caught! Thanks for a great day of fishing and memories on 4/18/06. You were everything and more we could have hoped for in a fishing guide. 10 minutes on the boat and you put us on high quality fish and keep us on big bass the full five hours. Besides knowing the lake, and how to fish the lake, you were a great teacher for my son. Thanks for the memories. Can't wait to fish with you again. Thanks for a fantastic day on the water! You called it a tough bite, but I call it the best day I have ever had fishing for bass. The twenty fish total averaging 3+ pounds with two 5 pound kickers in only six hours exceeded my wildest hopes. You provided good gear, a comfortable boat, great company and expert knowledge. You are the #1 guide on Clear Lake in my book, and I hope to go out with you again in the future. Sincerely, Brian Cartier, A very happy client!!! I just wanted to tell you what a great time Charlie, Bruce and I had fishing with you on Sunday. I have fished with guides for going on 25 years now and I know the good ones from the so so ones. You my friend, are the in category of the good ones! It was obvious you know Clear Lake, you know bass, and were very helpful to us in every regard. I know you were a little bit disappointed that we didnt catch more fish. But when you go out and get one or none, as we have been doing for months now, it was just great fun to get seven! I am sure that one us or all of us will want to fish with you again by next March or sooner. My 8 year old son D'Artagnan and I had an incredible time bass fishing with you on Monday the 13th of April 2009. You are a true professional in every sense of the word and my little boy will never forget his first bass fishing trip. Thank you for making his spring break one of the most special moments of his life. We look forward to fishing with you for many years to come. Thanks again Gary and D'Artagnan Reed. Just walked back into my apartment. I wanted to thank you for 12 GREAT hours of fishing-(yes I was counting). I truly wish we were going back out tomorrow. Your professionalism, attention to detail, and good old country kindness made this trip the best I have had yet. Hopefully you won't hold against me my New York background as well as my seeming inability to set the hook on the probable 6, 5 pounders I missed! You can trust I am coming back for that 10lb'er! Happy and healthy holidays! We wanted to thank you for a great fishing trip this past weekend. We have never been able to catch bass out of Clear Lake and you managed to find us fish, even after the storm the previous day. We had one of the best Valentine's Day ever. We have been telling our friends about the trip and I think a few will be giving you a call to book a fishing trip with you, especially after seeing our catch on the website. Hope all is well with you. I searched the web for my name, and others. Your page pops up on page 1 in a Google search for me, my son Blake and wife Leigh. We had a great time that day. Thanks again for your services. I hope you continue to make many a family happy for years to come. Happy Holidays from the Ernst Family. We too enjoyed fishing with you. One never knows what to expect when pulling someone's information off of the internet, but you were first class. You found the fish, had a great attitude, and are definitely someone I would fish with again. Hope to see you in March and thanks for the tips.